Creating ORM diagram with free templates and examples. ORM diagram has never been easier. Object-role modeling (ORM) diagram presents the mapping between classes and entities visually, which enables developer to gain a better understanding on how a row of data in database transform to/from object in memory. An ORM diagram is used to show the mapping between the ORM class and its corresponding entity. With Edraw ORM diagram software, the mappings between ORM classes and entities; between attributes and columns can be clearly identified. 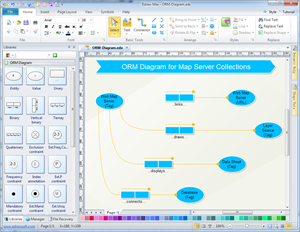 Edraw helps you create ORM Diagram easily and quickly. 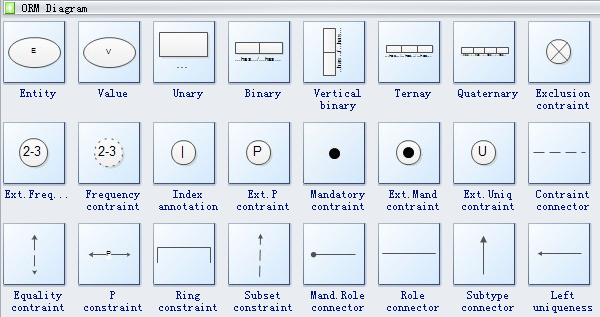 With its intuitive interface, easy-to-use drawing tools and lots of pre-drawn library symbols, Edraw manages to provide you with solution that meets any requirements of diagram designing. You can use its automated tools to design and customize your drawing. It has rich color schemes and fill options, and supports real-time previews. There are a variety of pre-defined themes for you to apply too. It's no doubt the most powerful drawing tool.